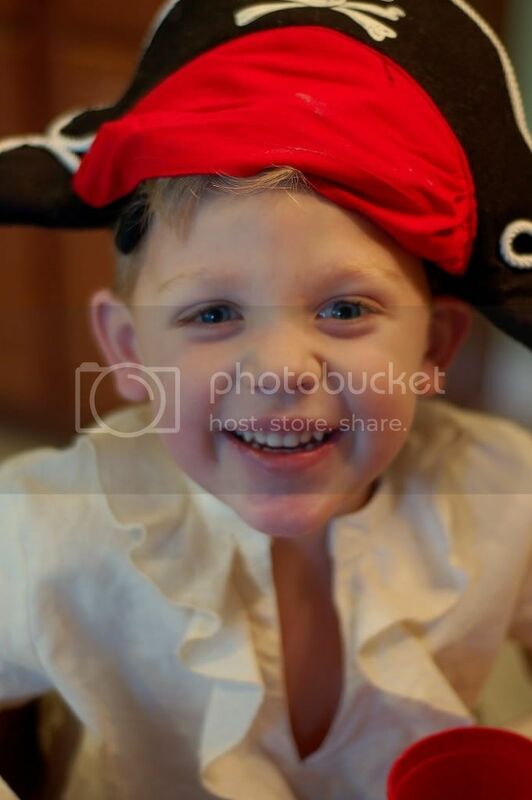 My little man turned four a few weeks ago. 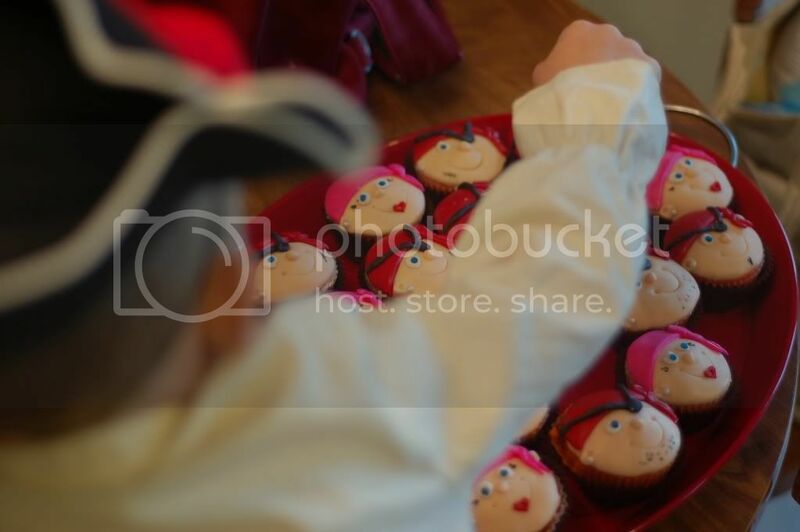 We had a big pirate party and since I like to try to make myself crazy I thought I would try out fondant for the first time. I skipped to marshmallow fondant since it's supposed to taste better. 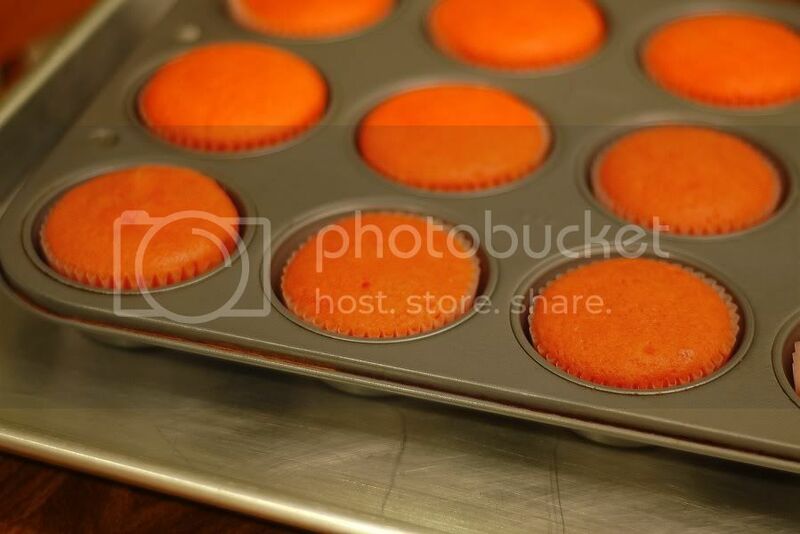 First, I made orange creamsicle cupcakes again (still his favorite color) with my standard doctored mix recipe. Next I made fondant. I followed Clara's awesome directions and made it in the microwave using C&H Powdered sugar, Jet Puff Marshmallows, and water. 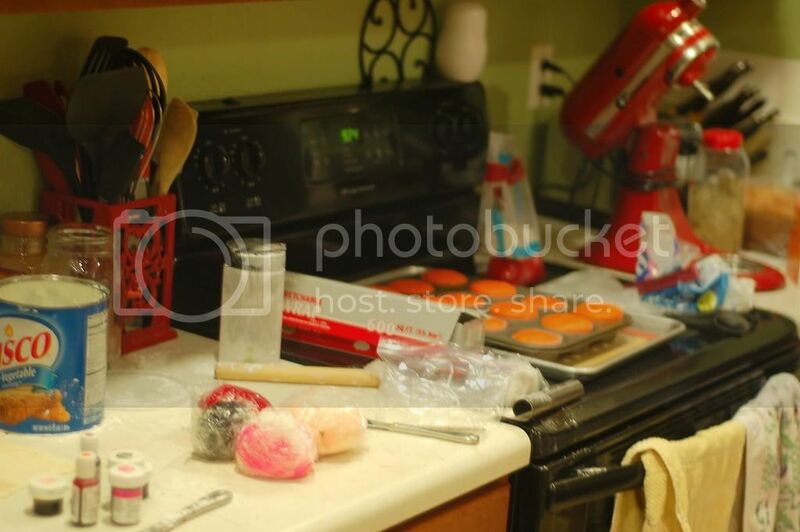 She's awesome and took pictures of the fondant process. You can see the recipe below. After you knead it and let it rest, you portion it out into the different colors you need. Get out the rolling pin, powdered sugar, and shortening. Look past the excessive mess. To color the fondant, you just knead in the gel food coloring until you reach the desired color. Make sure your hands are generously greased with Crisco (my tall man helped me knead my rich red, it took forever, and that really grossed him out!) Then rewrap and set aside each color. *update*- I had a reader ask where I found the flesh colored gel food coloring. It is from a Wilton Dora the Explorer Gel Food Coloring Kit I found at Joann ages ago on clearance (red and pink are infinetely practical at this house! )The color is called 'Dora Skin Tone'. Here is a link where you can find it on Amazon for about $5 with free prime/super saver shipping. To make the pirates, generously dust your surface with powdered sugar. 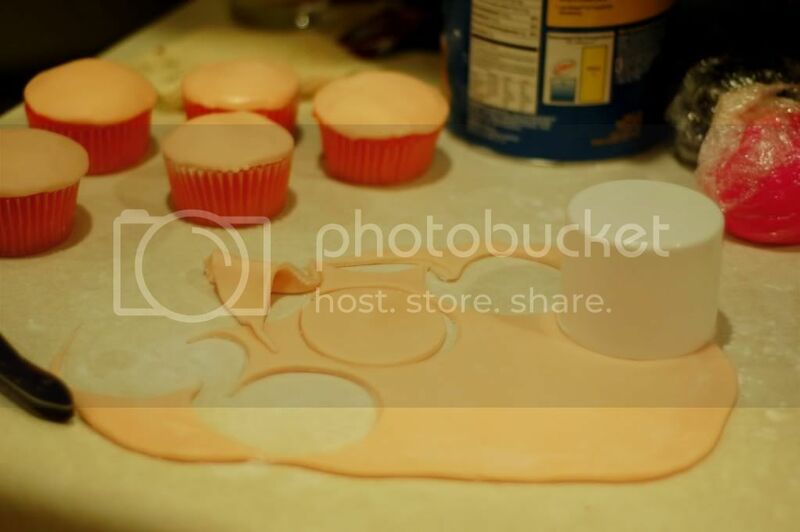 Roll out the skin tone and use a cutter to cut circles the same size as the cupcakes to make the faces. I used my cooking spray lid. 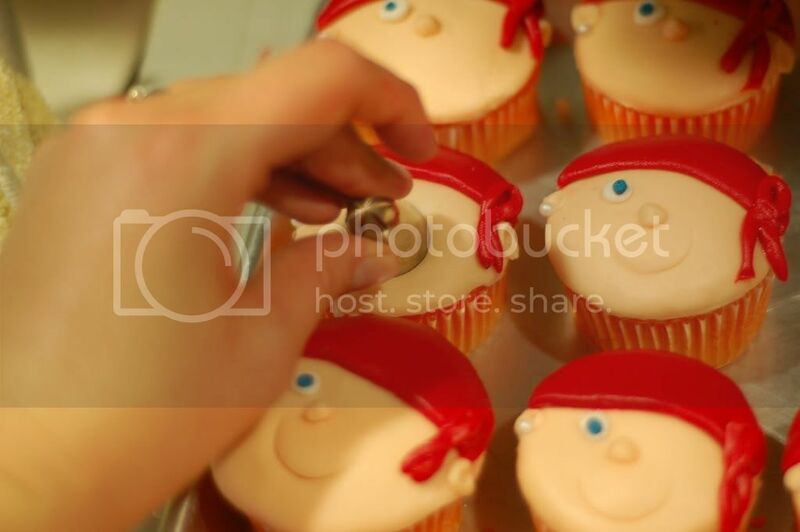 Now I totally faked how to make these pirates off of a picture I found online (like this one but I can't find the original now). I forgot that I would also need to make pirate ears and noses with the flesh tone- so make sure you save a little extra. This color is the one you need the most of by far. Smooth the circle over the cupcake and then shape little ears and nose. Mine are far from perfect but that's okay. I used a new cheap paintbrush from Michael's and dipped it in water then brushed the back of the pieces and pushed them onto the fondant. Then I used the other end of the brush to make the ear indentations. I've never taken a fondant class and just read a couple things online and they were perfectly cute and fine, even if they were far from perfect! So don't stress it too much! Next I rolled out the color for the scarves (pink and red). I cut strips about an inch wide and then used the same cutter to make the faces to cut matching circles for the hats. Paint brush, press on, etc. The I rolled little snakes out of the same color and criss crossed them to make the tie and put them on the right side. Then I did the same for little eyes- one for the boys and two for the girls. Then I pushed on big round blue sprinkles to be the irises (I marked them an edible food marker to be the pupils). I used my big cake decorating tip, the fat end, to make their smiles. You could use a paring knife instead. Then made little smiley marks by pushing in the tine of a fork carefully. To make the patches, roll a little circle and squish it (or use another big round bullet frosting tip to cut a circle). Glue it on with the wet paintbrush. Roll a little of the black fondant into a long strip and attach it to make the straps for the patch. There you have it! Just use the marker to add facial hair and scars. You can draw little lips on the ladies or use a big heart sprinkle like I did. Don't forget their eyelashes and earrings (also a big sprinkle- I used edible pearls but regular dragees would be perfect). Check out Michael's or the cake decorating store. This was my favorite part of the whole process, it was really fun to do all the scars and different faces! And they were a hit! Don't be afraid to try something new. This was pretty fun, a lot like working with Playdoh, even if I was stressing the whole time about the party (seriously, a bunch of four year olds?!) And now I'm not too worried about trying fondant again! Give it a try and let me know how it goes. It doesn't really take any special equipment- basic ingredients and a rolling pin are all you really need. You can do it! Melt marshmallows and 2 tbsp of water in a microwave safe bowl. Put the bowl in the microwave for 30 second intervals (stir between intervals) for about 2-1/2 minutes until marshmallows are melted. Place 1 to 1-1/2 lbs of the powdered sugar on the top of the melted marshmallow mix. Grease your entire hands and surface generously and dump the bowl of marshmallow/sugar mixture in the middle. Start kneading like you would bread dough. It will be VERY sticky at this stage! Add the rest of the powdered sugar and knead some more. Re-grease your hands and surface when the fondant starts sticking. If the mix is tearing easily or it is to dry, add water (about 1/2 tablespoon at a time). Continue to knead and add water until there are no bits of powder sugar visible. It usually takes about 8 minutes to get a firm smooth elastic ball so that it will stretch without tearing. Prepare the fondant for storing by coating it with a good layer of Crisco shortening, double wrap with saran wrap and then put in ziploc bag. Squeeze out as much air as possible. Let rest overnight for best results. Great photos, especially that last one. These are adorable! I've wanted to try experimenting with marshmallow fondant for awhile-maybe I'll try this recipe! Not only is your little guy insanely cute but those cupcakes are just too cha cha for words! Anne, these are SO CUTE! I love them! I'll bet that party was a total ball. These are gorgeous Anne! You are too talented! 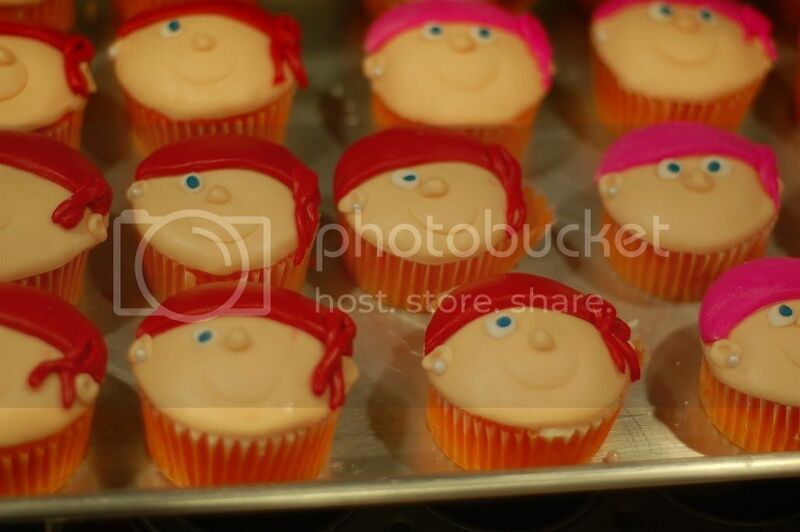 Seriously, Anne, the cupcakes are so cute. Can't believe little man is already 4! You are very talented! What a lucky birthday boy! This is a very special birthday memory you have created for you and your son to look back fondly to in the years to come. Your cupcakes couldn't have turned out more beautifully, Anne! Those are just perfect. You did a fantastic job. 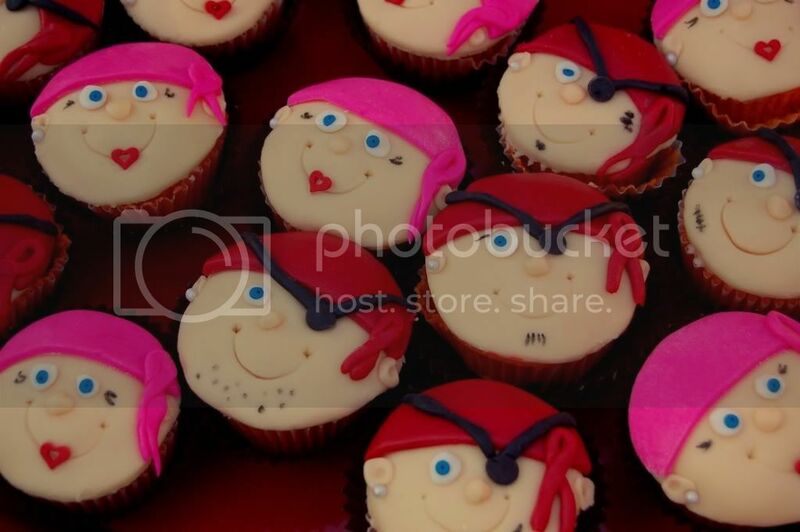 Your little boy's going to remember the cupcakes at his pirate party for decades to come! Anne your little boy is so beautiful! and your cupcakes are awesome... congratulation talented woman. I made these and they turned out great but my party is tomorrow. How do I store them for 1 day. Right now they are in a cupcake holder/carrier. Do I refrigerate them? Neistmama I'm so sorry that your commment was stuck in the spam filter and I just got it! 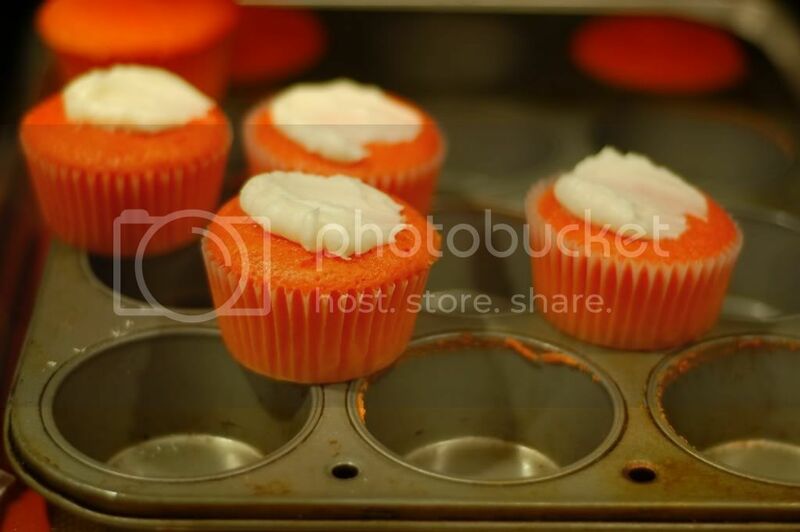 I hope your cupcakes turned out great and would love to see pictures! I was wondering what you used to get your fondant skin colored. Other sites say to use copper but it isn't carried in stores near me and I don't want to pay $5 for shipping from elsewhere... Thanks! I used Wilton Gel Color in 'skin tone'. It came from a Dora the Explorer four pack I bought at Joann ages ago. Sorry that isn't a huge help but I bet there is an americolor equivalent you could find at the cake store. I did find the Dora kit on Amazon with the skin colored gel dye. Here is the link. Hope that helps! Any chance you sell these already done?